In 1968 he was voted Radio Personality of the year for his satirical comedy show LISTEN TO THIS SPACE. At the same time JUST A MINUTE began on Radio 4, and he is still hosting this comedy game show after 47 years. He has appeared in feature roles in many British films, and one American film with Jerry Lewis. He was in one series of Dr Who, THE CURSE OF FENRIC. He has worked consistently in the West End of London in various plays. He starred for over a year in the comedy BOEING-BOEING, UPROAR IN THE HOUSE, SAY WHO YOU ARE, and latterly in a number of musicals CHARLIE GIRL, Stephen Sondheim’s INTO THE WOODS, and more recently in two London seasons and a national tour of the cult musical THE ROCKY HORROR SHOW. His autobiography THE STRAIGHT MAN – MY LIFE IN COMEDY was published in 1994 and in 2010 he produced a book of memoirs – NICHOLAS PARSONS WITH JUST A TOUCH OF HESITATION, REPETITION AND DEVIATION which has been very well received. He works actively for a number of children’s charities and is ex-President of The Lord’s Taverners. He is an Ambassador for Childline and a Barker of the Variety Club. He is a member of the Grand Order of Water Rats. He has been honoured by St Andrews University with a Doctor of Laws in recognition of his work as Rector there for three years. In 2003 he was given an OBE for services to the theatre and broadcasting and in 2013 he was honoured with a CBE for his work for charity. A simple title for a wholly out of the ordinary event. A show full of humour, comedy and acutely observed characterisations. 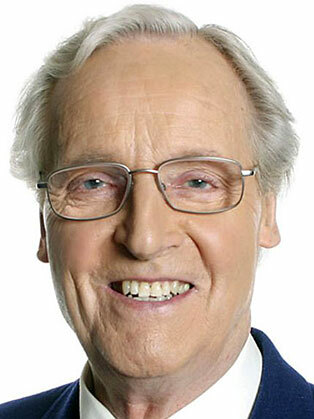 Nicholas Parsons demonstrates his unique ability as a solo performer and raconteur in this anecdotal entertainment based on his experience of life and working in the various media of an unpredictable and always fascinating profession. His ability to laugh at himself and see the humour in his early life and struggles to be an actor, while serving an Engineering Apprenticeship in the harsh world of Clydeside, building to anecdotes based on his varied work in so many branches of show business, is a constant joy and a humorous revelation that keeps his audience continually enthralled. This is a very entertaining and vibrant show, as Nicholas Parsons takes his audience on a humorous and nostalgic journey through the memorabilia of his long and eventful life, seeing the funny side of every situation as he highlights with superb and often hilarious observation those events that have shaped his career. His early struggles to enter the difficult and unpredictable world of show business and to achieve something in that amazing and challenging world. Also the stories of how he survived in the demanding and heady world of entertainment and achieved the position he now commands.